Life in the Freezer is a documentary hosted by David Attenborough. I found myself glued to the TV, fascinated by the beautiful scenery of icebergs with"ice falls" breaking off and dumping themselves into the sea of blue and the multitude of animals and their feeding, mating, and habitat patterns. 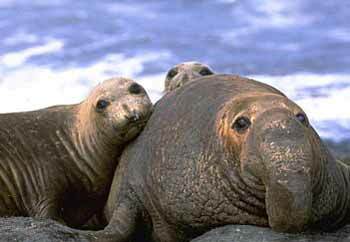 David Attenborough shows amazing courage of his get close up and personal footage of bull elephant seals. Each episode, there are six of them, shows changes in season explored in detail. I was simply blown away by this DVD. You felt as though you were standing beside him and seeing everything that he saw and felt. Antarctica can be an exciting or threatening life for the animals that exist there. David Attenborough explains why certain birds are migrating to Antarctica while showing the humpback whales feeding on krill, which is a type of shrimp like crustacean. Two million King Penguins live in Antarctica. As the ice retreats Elephant Seals or Beach Masters, mate with 100 females and brutally fighting off competitors, while the Albatross faithfully mates for life and lays one single egg. (Listen to the Adele penguins and then click back button) As an educator, I learned so many interesting details about Antarctica and its habitants. Adele penguins march over 60 miles to reach a breeding ground. Most abundant of all the world's penguins, the Macaroni is also the largest of the six species of crested penguins. 95% of the world's fur seals land in South Georgia! Can you imagine? 95%! 100,000 Chinstrap Penguins make the trip to land on Deception Island. As Attenborough puts it, "Nature's greatest rush hour." This is where they mate and could end up as prey for fur seals. 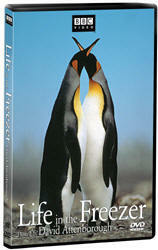 As shown by this marvelous DVD the Antarctic is teaming with life! Even scientists live there fearlessly defying blizzards of over 100 mile an hour winds to report on tagged animals, monitoring their weight, and visiting breeding grounds. Every teacher should be showing this as part of their curriculum on the Antarctic.